So for those unaware, my most recent video about Cicada 3301 contained a puzzle. Not a puzzle related to Cicada but a puzzle of my own making. Throughout the video I hid a number of secret codes and messages and, for the past week, a few dedicated viewers have been hard at work trying to solve the many codes and riddles I left for them to find. I've always been a fan of video game Easter eggs, ARGs, and online scavenger hunts so it seemed fitting to include such a puzzle in a video about, well, puzzles. Many solvers took to the fan-moderated Discord server while others attempted to solve it on their own. A specialized subreddit was also created. Now, a week later, the puzzle has finally been solved. While it was largely a collaborative effort, Discord user Hedare was the first to reach the end. This Google Sheets document created by the solvers perfectly sums up the puzzle but I thought some might be interested in hearing me explain it as well. Only trust paths through lemmi.no. The end of the path your findings must go. The first sentence cautioned participants to only trust links to or from my website as a safe-guard against impostors. The second sentence was an allusion to the SVG paths that make up the jigsaw puzzle pieces. More on that later. Behind ten signs, an image you'll find. Scour the timeline to locate the signs. 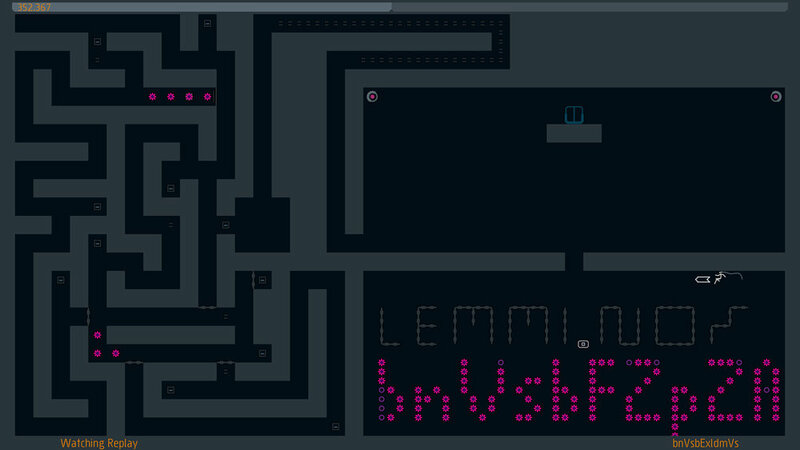 In hindsight, making N++ part of the puzzle was not the best idea as it costs money and only served to stifle participation. I mainly included it because I'm a big fan of the game. T25lIG9yIHRoZSBvdGhlciBidXQgbm90IGJvdGgu → One or the other but not both. Multiply the longest word with the total amount of gold. T‌h‌e‌n‌ ‌di‌v‌i‌d‌e‌‌ b‌‌y‌‌ ‌‌t‌‌h‌at‌‌ ‌‌w‌‌h‌i‌ch‌‌ ‌y‌o‌u‌ cannot see. The longest word referred to the longest word used in the video which is interconnectedness at 18 letters. The total amount of gold referred to the 211 gold coins featured in the N++ level. T‌h‌e‌n‌ ‌di‌v‌i‌d‌e‌‌ b‌‌y‌‌ ‌‌t‌‌h‌at‌‌ ‌‌w‌‌h‌i‌ch‌‌ ‌y‌o‌u‌ cannot see. The first 16 decimals made up the password. This equation was the longest hiccup of the puzzle mainly because I screwed up and made it a bit too ambiguous. The initial idea was for all the passwords featured in this puzzle to be of equal length to the URL of the page they unlocked. So the number 0690721274506238 was to be capped at 16 decimals because the URL path 6e756c6c50616765 was 16 chars in length. Much like how the previous password 546869731911625b0e76375b2f28 was 28 chars long because the URL path 5468697349735468654f74686572 was 28 chars long. But somewhere along the line I completely forgot about that and altered some of the passwords without consideration for their length. For example, the first password ThisIsThePassword is 17 chars long while the URL path 6e756c6c566964 is only 14 chars in length. So solver had no way of knowing that the password should be 16 chars in length and got stuck. But I remedied my mistake by providing a few extra hints and eventually someone finally managed to figure out the password and the puzzle solving continued. The unlocked page contained a link to yet another unlisted YouTube video. You must unlearn what you've learned. From dot to dot the children would trail. The game is the same, except for the scale. This is the end, remember the path. It's time to combine what's been found on the map. By tracing a line between each capital featured in the video the characters L, 4, V, E, G, and 8 could be produced. You've finally reached the end of the puzzle. Should you happen to be the first to arrive at this page then the link below will grant you a reward. Thanks to everyone on the Subreddit and Discord server who participated. It's been a lot of fun watching you struggle for the past couple of days. Wasn't sure you were going to make it all the way through but here you are. Had to resist the urge to help you on numerous occasions. I wish there was a way to reward every single one of you but hopefully the pain JOY of codebreaking was rewarding in and of itself. Thanks for participating and keep an eye out for future puzzle. Discord user Hedare was the first to solve the puzzle and claimed the $100 Amazon Gift Card voucher as a reward. And that was the end! Thanks to everyone who participated and keep an eye out for future puzzles.